The administrations of the separatist enclaves in eastern Ukraine have long regarded international organizations with suspicion, accusing some of them of spying for the West. At the end of last week UN agencies and several NGOs were ordered out of Luhansk.The organizations were not named, but Médecins Sans Frontières (MSF) closed their offices, saying it was “extremely concerned” by developments. MSF continues to work in Donetsk, which has a separate government to the one at Luhansk. Relationship between the separatists and NGOs soured as the rebellion against the Kiev government gathered momentum in the east. Adding to the tension was the fact that many of the local staff working for these organizations were young, westernized and opposed to secession from Ukraine. To add to the chagrin of the rebels, some of them were also active in political and human rights fields; agents of Kiev according to their opponents. After being seriously roughed up, the former official for the International Rescue Committee (IRC), a humanitarian NGO (Non-Governmental Organization) operating in Donetsk in eastern Ukraine decided that he was not going to wait for the knock on the door by the men in camouflage. He moved to another city. When Russian President Vladimir Putin addressed the General Assembly on Monday, he spoke about a “great and tragic migration of peoples” that requires members of the U.N. to unite to stabilize Syria. The way to do that, he said, is to “cooperate with the Syrian government and its armed forces who are valiantly fighting terrorism face-to-face.” To do otherwise would be a “mistake,” he said. “We should finally acknowledge that no one but President Assad’s armed forces and Kurdish militia are truly fighting the ‘Islamic State’ and other terrorist organizations in Syria,” Putin said. Built to house 1,800, the federally outsourced Traiskirchen facility, 20 kilometers south of Vienna, is now a temporary home to 4,500 refugees. Until several weeks ago, more than 1,000 people were sleeping on the open lawn, bracing through rain storms and heat-waves alike without any shelter, a situation criticized even by Austrian Interior Minister Johanna Mikl-Leitner, who was largely seen as responsible for the inadequate response. Images of people sleeping in the open shocked Austrians, said Dunja Gharwal, one of many volunteers independently helping refugees in Traiskirchen. “Austria is a very rich country. We really sit here in abundance, and this is not necessary,” she said, calling it her country’s duty to welcome refugees. On a recent afternoon, locals parked outside the gates of the former school and unloaded jackets and sneakers in all sizes, as well as thick coats, hats and gloves for the approaching winter to clothe those staying at the refugee camp. Some bosses allowed volunteers to take paid leave if they wanted to help at camps. Big conglomerates are initiating vocational training programs for young refugees. Austrian singers and bands are organizing a free concert called “Voices of Refugees” in Vienna to collect donations for asylum seekers. Austrian state broadcaster ORF recently set up a website aimed at linking Austrians with vacant apartments or houses with refugees and the organizations that assist them. “There’s an almost unbelievable readiness to help,” Draxl said. There is a small village in the mountains of Lebanon that is hosting more Syrian refugees than all 50 U.S. states combined. Ketermaya is a quiet little place surrounded by patches of farmland. It isn’t a particularly wealthy town, but the residents here have taken in thousands of refugees fleeing the war in Syria. “We have a history of welcoming refugees,” says Ali Tafesh, a local business owner. “In 2006 we did the same,” he adds, referring to the displacement of people caused by Israel’s invasion of southern Lebanon that year. Tafesh has done more than most. When Syrian families started to arrive in the town in the early days of the civil war, he arranged housing for them. When there were no more places left to stay he offered up his own land. “We built the first tent for two families. Then more people came and we built a second, and then it just kept growing,” he says. Tafesh hosts 330 Syrians on his one-acre plot–a stony patch of land on the side of a hill, with olive trees scattered in between makeshift tents. At his own expense, he built a toilet and installed running water into the camp. He doesn’t charge the residents of this camp, but people like him are in the minority. Most refugees pay rent to landowners, even when their accommodation is little more than a wooden shack. The U.S. has resettled 1,500 Syrian refugees since war broke out in 2011 (the small village of Ketermaya hit this number in July 2014), and aims for that number to reach 5,000 by the end of the year. President Barack Obama announced recently that he had ordered his administration to prepare for double that number in 2016. Aid agencies have said this is not enough: Oxfam America had been calling for the U.S. to resettle 70,000 Syrian refugees. There are currently more than one million registered Syrian refugees in Lebanon (the actual number of refugees is thought to be much higher). If you include the estimated number of unregistered refugees, Syrians now account for more than a quarter of the country’s population. There are no official refugee camps in Lebanon. Instead, refugees are scattered across the country and make their home on whatever land they can find. The nearly 12 million Syrians — half of them children — who have fled their homes to protect themselves and their families have seen unspeakable violence, both during the war in Syria and during their escapes. These experiences are understandably traumatic, but their long-term effect may be even greater than we realized. A new study has found that half of the Syrian refugees who have fled to Germany are experiencing psychological distress and mental illness resulting from trauma, Germany’s chamber of psychotherapists announced this week. The researchers evaluated refugees seeking asylum in Germany, and found that more than 70 percent had witnessed violence and that about 50 percent were victims of violence themselves. The findings also revealed that 40 percent of adult refugees experienced nightmares, and 50 percent had vivid flashbacks reliving a traumatic event. Forty percent of the children who were evaluated had witnessed violence, and 26 percent had watched their families being attacked, the new research found. 1 in 5 suffers from a psychological disorder as a result of trauma. Dietrich Munz, president of the German chamber of psychotherapists, estimatedthat while 3,000 to 4,000 psychotherapy sessions are offered in German refugee camps each year, the demand may be 20 times higher. Syrians account for 50% of the refugees arriving in Europe after crossing the Mediterranean, but several other nationalities are turning up in large numbers. According to UN figures, 75% of the total refugees hail from countries in the midst of armed conflict or humanitarian crises. So apart from Syria, where are they coming from, why did they leave, and how are they reaching Europe? Afghans – 13% – According to the Afghan government, 80% of the country is not safe, as extremist groups such as the Taliban and Islamic State’s local affiliate are waging insurgencies in many provinces. Most are walking over the border into Iran, a trek that takes up to two days. Then they drive to Iran’s border with Turkey, where they cross again on foot, in another laborious hike. Once in Turkey, Afghans take a day’s bus journey to the same Aegean ports many Syrians are using to reach Greece. Eritreans – 8% – Eritrea is Africa’s version of North Korea, a country with no constitution, court system, elections or free press. Outside of the metropolitan elite, most Eritreans must submit to a form of forced labor – lifelong military conscripts who have no choice about where they live or work. Any dissenters are sent to prison without any judicial recourse. Most walk over the border into Ethiopia or Sudan, a dangerous first step that sees some shot by border guards, begin a brutal journey through the Sahara to Libya, [where] they are held in smugglers’ compounds and usually tortured until their families send the $2,000 required for payment before the refugees are permitted to board a ramshackle boat to Italy from one of the country’s western ports. Nigerians – 4% – Boko Haram, the Islamist extremist group, continues to fight an insurgency in northern Nigeria, killing and kidnapping locals and forcing many to flee. Other Nigerians are escaping from poverty. Most head over the northern border to Niger and join the smuggling trail to Libya, experiencing similar horrors to Eritreans crossing the desert from Sudan. Somalians – 3% – Islamist insurgents, including al-Shabaab, are fighting an insurgency, with civilians caught in the middle. One popular route is through Kenya, Uganda and south Sudan. Then people head north to Sudan, where most follow the same route and adversities as the Eritreans. But a smattering of refugees now follow the Balkan route – into Kenya, fly to Iran, then cross the Iranian-Turkish border, before heading by boat to Greek islands. Pakistanis – 3% – More than 1.2 million Pakistanis have been displaced by insurgencies in north-west Pakistan. Like Afghans, Pakistanis walk into Iran, then take a bus to the border with Turkey, where they cross again on foot. They then pick up the Balkan route that begins on the Turkish coast. Iraqis – 3% – Vast swaths of Iraq, including its second city, Mosul, have recently been conquered by Isis, worsening a nightmare that began with the west’s invasion of the country in 2003. Iraq borders Turkey, so most reach Turkey by land and then take boats to Greek islands. Sudanese – 2% – Civil wars in the country’s Darfur and Kordofan regions continue to displace civilians. Darfur is still unsafe – a Human Rights Watch report recently alleged that the Sudanese government had carried out many killings and mass-rapes of civilians in dozens of towns. Sudanese refugees are smuggled to Libya, and then across the Mediterranean to Italy. Like Eritreans and Somalians, many die of thirst in the desert and fall victim to extortion and torture by smugglers in Libya. The throngs of desperate migrants fleeing Syria and the images of children washing up on European shores have spurred the Obama administration into action, officials said. The Obama administration is preparing to announce a plan to admit more refugees — from 70,000 this year to 85,000 next year and 100,000 in fiscal 2017 — but at this point the numbers being proposed are too small to relieve the crisis streaming out of Syria. The problem with the plan, no matter how quickly adopted, is how long it will take to have any effect. Migrants applying for refugee asylum in the United States now will not have their applications considered until at least 2017 because of a long backlog. And once an application begins to be considered, the asylum seekers can face a further 18 to 24 months before they are granted or denied asylum. Human rights experts said that the United Nations has already referred over 16,000 Syrian refugees to the U.S. for vetting, and the 10,000 increase would come almost exclusively from the backlog of Syrians who have already applied, not the people who are fleeing now. The U.S. has accepted only 1,500 Syrian refugees since the war began. Imagine every man, woman and child leaving home in 29 states, mostly in the U.S. West and Midwest of the United States. That’s everyone west of Ohio and Kentucky and north of Texas, all the way to California. The 158 million people in those states make up the same share of the U.S. population — 49% — as the proportion of Syrians that have fled carnage there. The war in Syria is so hellish and unrelenting that more people have left that country than any other in recent years. One of every five displaced persons in the world is Syrian. Worldwide, 59.5 million people are on the move as refugees or displaced people within their home countries. That population would be enough to make them citizens of the world’s 24th biggest country! Humanity has never seen such displacement. Ever. 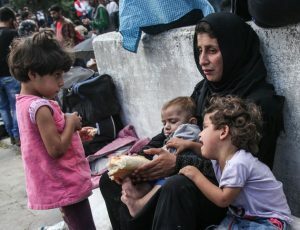 “Wars, conflict and persecution have forced more people than at any other time since records began to flee their homes and seek refuge and safety elsewhere,” the United Nations said in June. At least 15 wars and conflicts are to blame — in Africa, the Mideast and Asia. Germany: As Germany faces the largest share of Syrian requests for asylum in Europe, Chancellor Angela Merkel called for quotas to be set for each country to take a share of displaced people, including from Syria. There could be 800,000 applications for asylum in Germany this year, and the country could take 500,000 refugees annually for several years, Vice Chancellor Sigmar Gabriel has said. Sweden: Sweden joins Germany in demonstrating a high standard of responsibility in the refugee crisis, and Swedish Prime Minister Stefan Lofven joined Merkel at a press conference this week in urging a Europe-wide solution for hosting refugees. In the 1990s, Sweden accepted 84,000 refugees from the Balkans. France: French President François Hollande has said France is ready to take on more responsibility and host 24,000 refugees over the next two years. United Kingdom: The United Kingdom will likely see an upswing in asylum requests now that it has said it will take up to 20,000 Syrian refugees over the next five years. But Britain will focus on resettling vulnerable refugees from camps in countries bordering Syria, not those who have already entered Europe.The refugees will receive a five-year humanitarian protection visa. Britain has been the second largest provider of humanitarian aid to Syrian refugees within the Middle East region. Denmark: Denmark has received a relatively large number of Syrian asylum requests but has sought to discourage the arrival of more migrants. The country earlier had paid for ads in Arabic in four Lebanese newspapers to get the word out about its new, tightened restrictions — such as reducing social benefits — to try to prevent refugees from getting into the Scandinavian nation. Hungary: Many Syrian refugees are reluctant to register an asylum application in Hungary. Having traveled north through the Balkans, those arriving on the country’s border with Serbia have had police greet them, and they’ve been forced to wait, sometimes for days, in holding areas and transit camps, where conditions are said to be poor. Hungary’s right-wing government, which has been trying to stop the flood of migrants, has erected a barbed wire fence along its more than 160-kilometer (100-mile) border with Serbia to prevent them from crossing there. United States: Only about 1,500 Syrian refugees have been admitted to the United States since the start of the conflict in 2011, the vast majority of them this fiscal year. In the face of growing questions about such small numbers, President Barack Obama ordered his administration to “scale up” the number of Syrian refugees — at least 10,000 in the next fiscal year, a White House spokesman said Thursday. Canada: More than 2,370 Syrian refugees have resettled in Canada since January 2014, and the government promised in January to accept 10,000 Syrian refugees over a three-year period. Australia: Prime Minister Tony Abbott said his country would take in an extra 12,000 migrants fleeing conflict in the Middle East. Priority would go to persecuted minorities — especially women, children and families — who are in camps in Jordan, Lebanon and Turkey, Abbott said.